The last thing to do is close-out the top of the MLG area. The plans have you leave two small diameter holes for inspection access to the MLG. Since I routed the brake lines on top of the MLG, I needed slightly bigger holes to ensure I could get to the brake lines if needed. So, rather than the plans round inspection holes, I built rectangular holes to give me more room. I also wanted to build access hole covers to help muffle any noise coming from there. With these, I can access any of the adel clamps holding the brake lines if I needed. 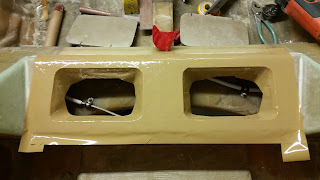 After following the plans to glass one side of the PVC foam, cut it to shape, and fit the pieces to the MLG bulkhead area, I traced rectangular panels symetrically on the port and starboard side of the horizontal panel. 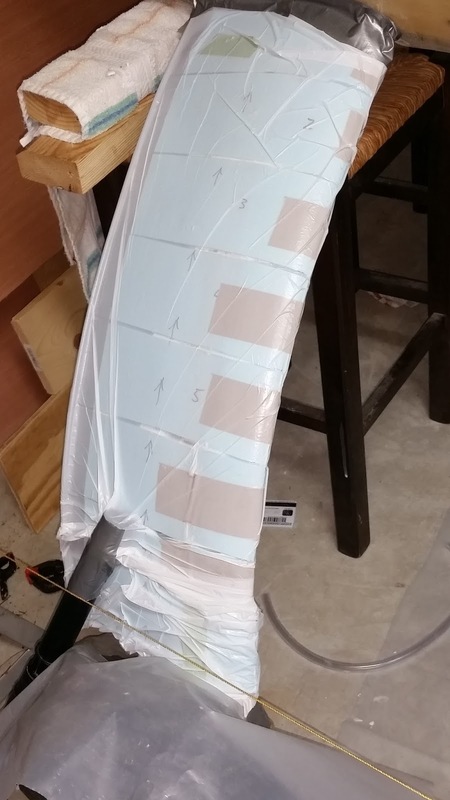 at a roughly 45 degree angle before installation in fuselage. These covers were then cut out with an angle inward from the top such that they would be self supporting when laid in place. The top and side panels were then floxed in place in the fuselage. Then, with the covers laid in place, I glassed the entire thing per plans. 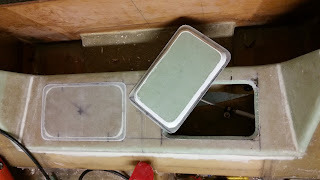 Before it cures solid, I was sure to cut the inspection panel covers lose...it would have been much harder after cure. 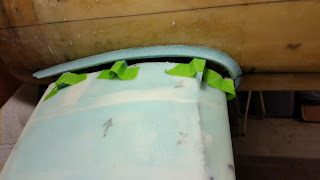 inspection holes are taped up with box tape. 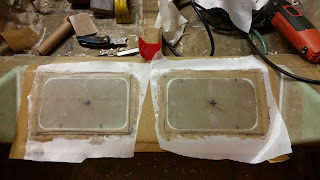 After the MLG close-out was cured, I removed the panel covers that I had already cut lose and did some clean up work to make sure the openings for the inspection panel covers were nice an symetrical. Then I placed box tape all around the area were the inspection panel covers will go. Glassed 2xBID over the inpection panel covers in place. I placed the inpection panels in place with dry micro around the edges to help create a nice clean and gapless seal. After cleaning up the excess micro that squeezed out the top, I glassed over the panesl with 2xBID extending past the edges of the panels approx 1". I peel ply'd and allowed it to cure. 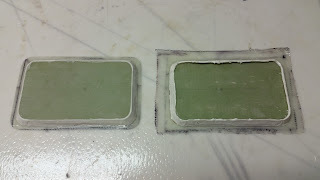 After cure, I popped them lose and trimmed the edges of the covers to approx 1/2" wide and cleaned up the excess micro. I think the only thing I'll do to secure them is maybe use a dab of clear silicone sealent in a few spots. That should keep them in place with no rattles. In theory, I'll only need to remove them every once in a while to inspect the top of the gear or brake lines. Inspection panels fit nicely ! Finished ! Nice MLG inspection panels that provide access while helping keep out unecessary noise. 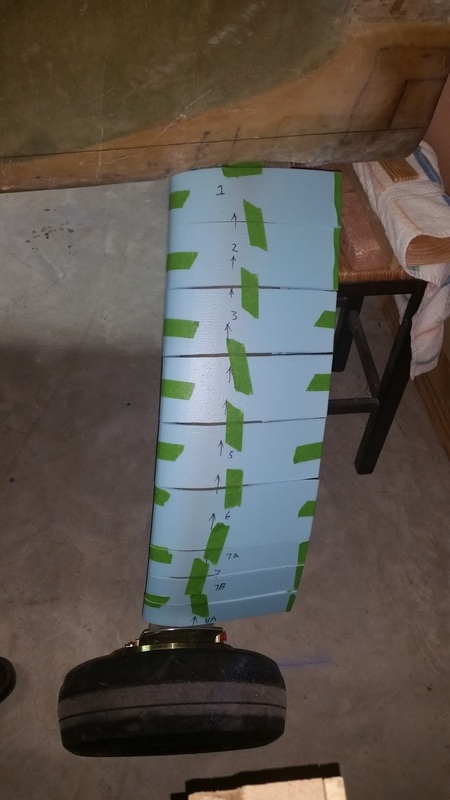 Chapter 9 Complete...On to the first airfoil ! SS Braided or AL Tubing ? For this step, I'm only running the brake lines from the calipers, up the strut, and through the fwd MLG bulkhead. At that point I'll cap them off and wait until a later chapter to run the lines up to the front where the resevoirs and master cylinders will be. 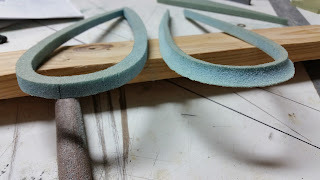 I chose to use SS braided PFTE lines (purchased from Pegasus Racing) from the calipers and up the strut because of the flexibility and movement of the MLG bow. 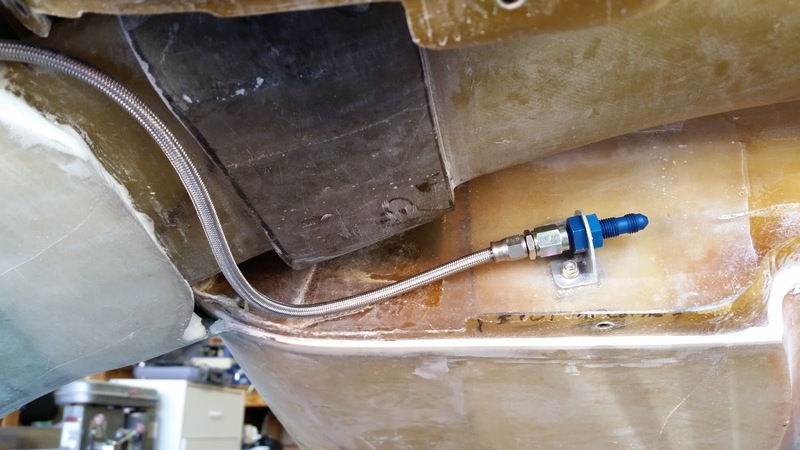 Once through the Fwd MLG bulkhead, I'll convert to lighter weight AL tubing to run to the nose where I'll probably convert back to SS braided to the resevoirs. Here are links to what I used.. 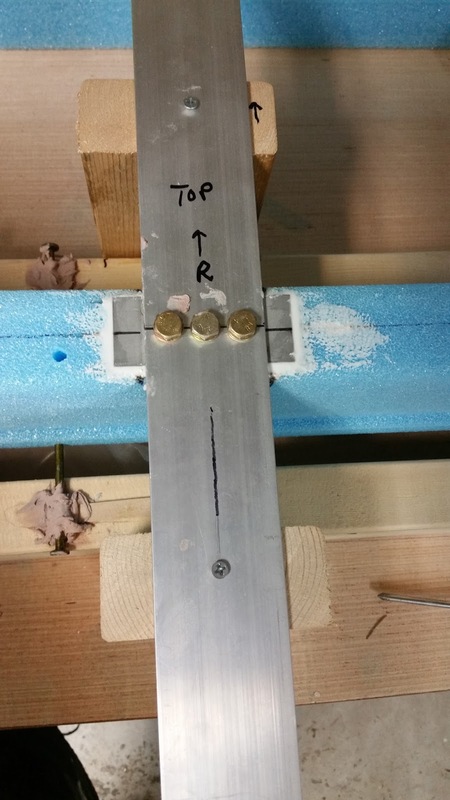 The angle at the caliper end was such that I chose a 45 degree angle NPT/AN fitting and ran the line directly to the connection. 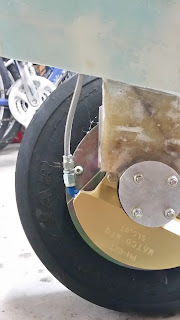 With the direct connection I didn't feel I needed to include a service loop in the brake line as I have some slack I can pull from up between the bulkheads if needed. 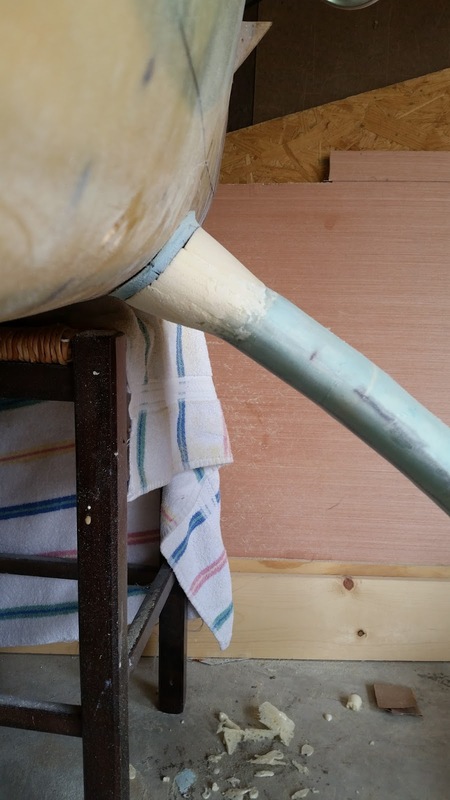 Don't forget to use a bit of pipe sealant seal on the NPT end...NOT on the AN ends. I used Permatex thread sealant that you can get at most local auto supply stores. in the way of the MLG access cover. 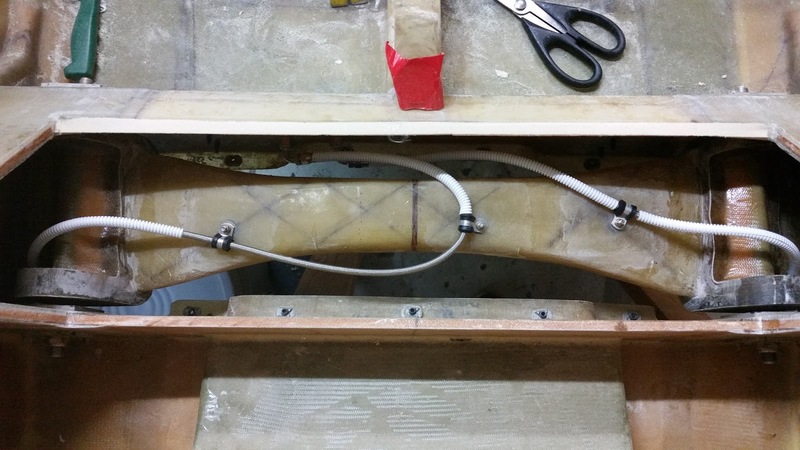 Routing Challenges: My challenge was where to run and mount the braided line in the gear-well. It needs to be run in a way so it won't chafe on any structure, and doesn't get in the way of my main gear cover. I first ran it below the gear bow to a connection at the fwd bulkhead, and then planned to convert to AL tubing and complete the run to bulkhead connectors. This would give me easy access to disconnect the lines if I ever needed to remove the MLG bow. 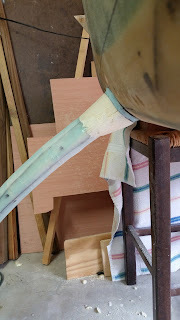 This would have worked, but I wasn't comfortable with how the line transitioned from the gear leg to down under the bow...I couldn't find a good way to secure the line without causing fit problems with the MLG cover. So I rethought the routing and decided to run the lines up over the MLG bow and secure the lines with a few adel clamps. 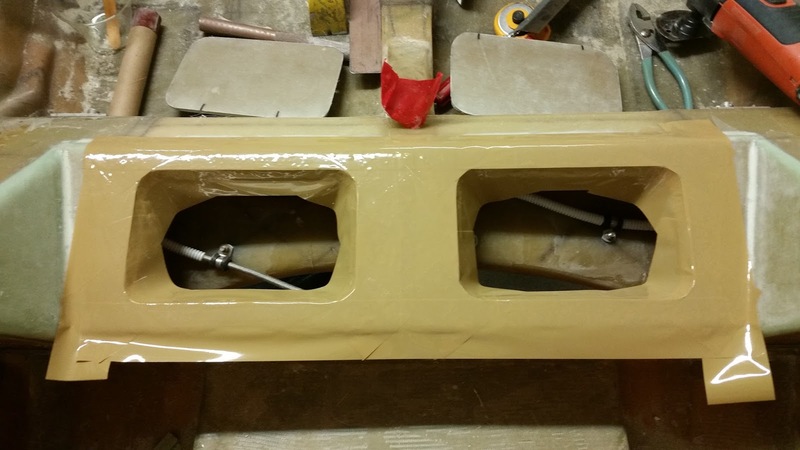 The adel clamps are secured with Clickbond studs floxed to the MLG bow and secured with 2xBID. The lines then go directly to the bulkhead connectors via 90 degree AN-3 hose end connectors. This seemed to work out better and I can still access the bulkhead connections to remove the MLG if needed. 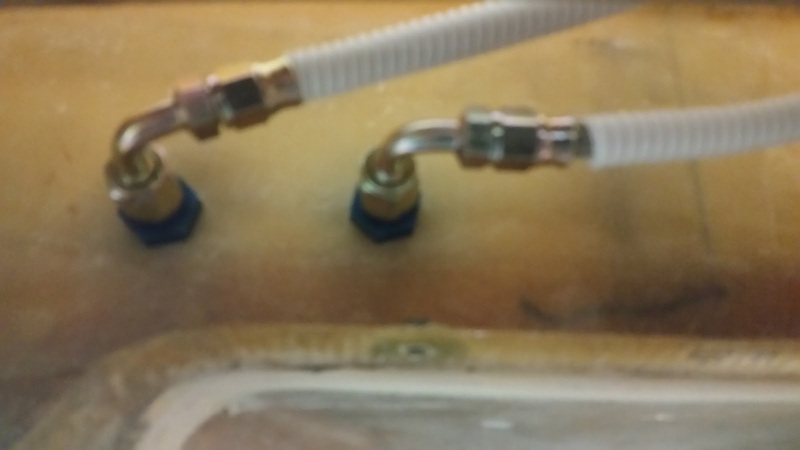 nylon split tubing for abraision protection in certain areas. Next...Close out of the MLG Access and Ch 9 completion ! Now that the MLG fairing is done, there needs to be an intersection fairing that makes a smooth transition between the fuselage and the MLG. The key here is that it has to allow for movement between the two. 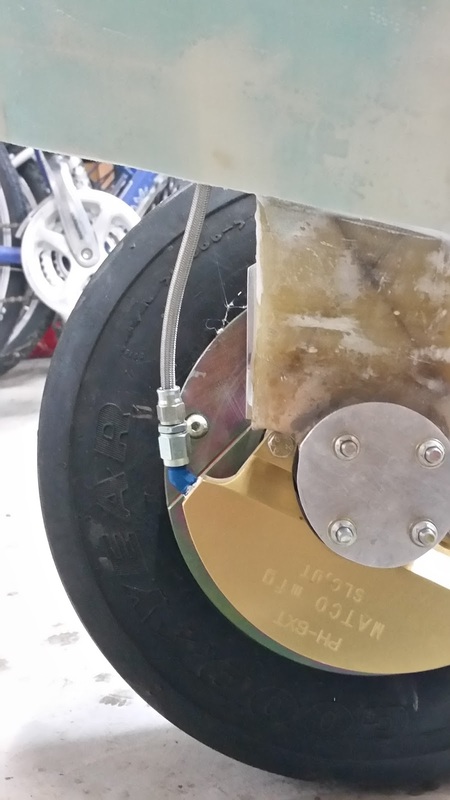 With weight on the gear and on landings, the gear strut will flex up so the fairing has to allow that without breaking anything. I really liked Wayne Hick's solution. See his instructions here for details. I will only summarize my attempt at it below. 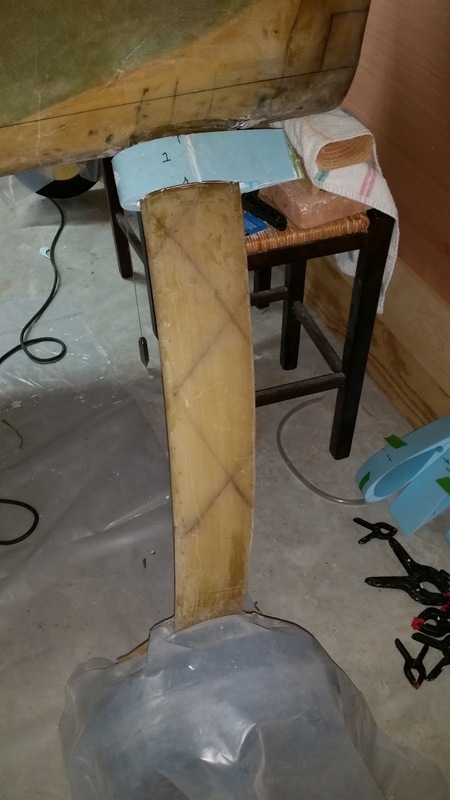 For starters, I crafted the fuselage side of the fairing out of left over 3/8" PVC foam. 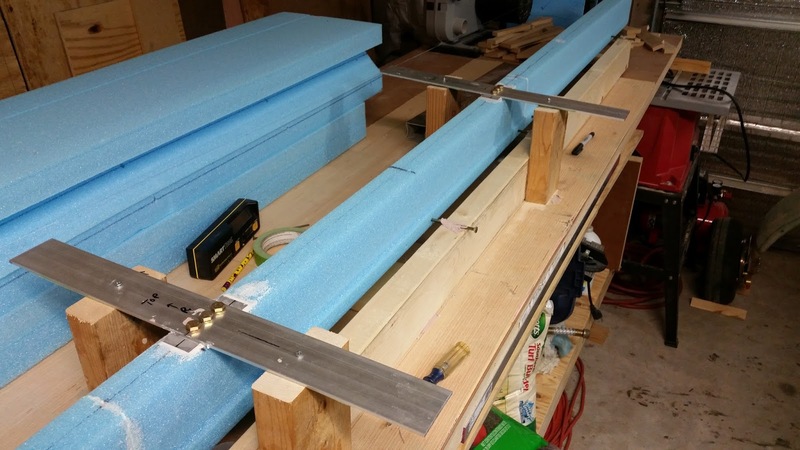 This will form the curvature to the fuselage. I used the large end of the Eureka CNC MLG fairing I had trimmed off as the template for the airfoil shape. 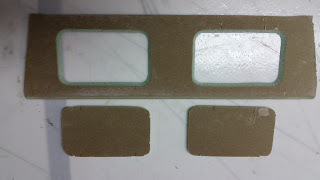 In the pic, you can see the before and after shaping the contour. 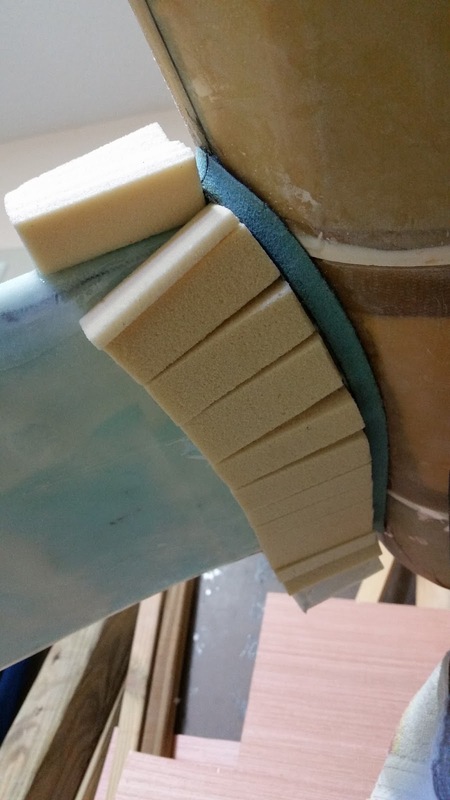 I glued the top side of the fuselage faring to the fuselage using scrap pieces of 3/8" foam to ensure the necessary clearance between the fairing and the MLG. Afterward, glue the bottom portion to the underside including the MLG cover. Don't worry, this will become a permanent part of the cover but it will stoll be removable when done. 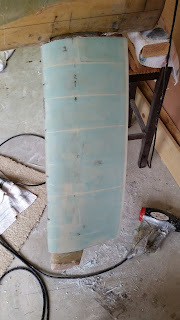 Now I used other scrap Last-A-Foam approximately 2" wide to serve as the transition from the fuselage-side fairing to the MLG fairing. 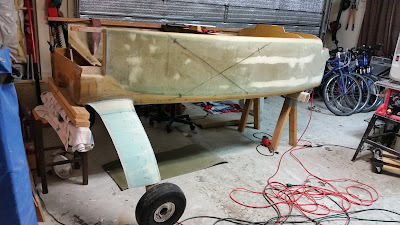 I glued it to the MLG fairing butted up against the fuselage-side fairing. 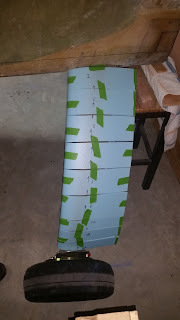 I used expansion foam to fill in the gaps and began sanding to match the fuselage fairing and gently fair it into the MLG fairing. 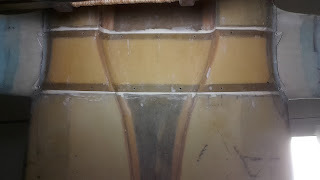 Here you can see the both starboard (left pic) and port (right pic) from the nose looking back after being sanded to shape. 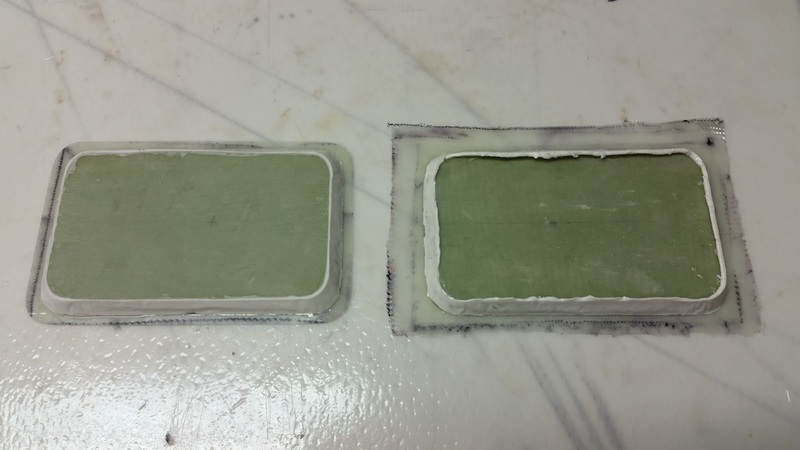 I'm not sure how I did it but I seemed to be able to shape them almost identical without the use of any templates. Not shown (sorry) is the shaping of the back edges curving into the fuselage. See pics below after glassing. Once I was happy with the shape, I glassed the bottom of each fairing with 2xBID. 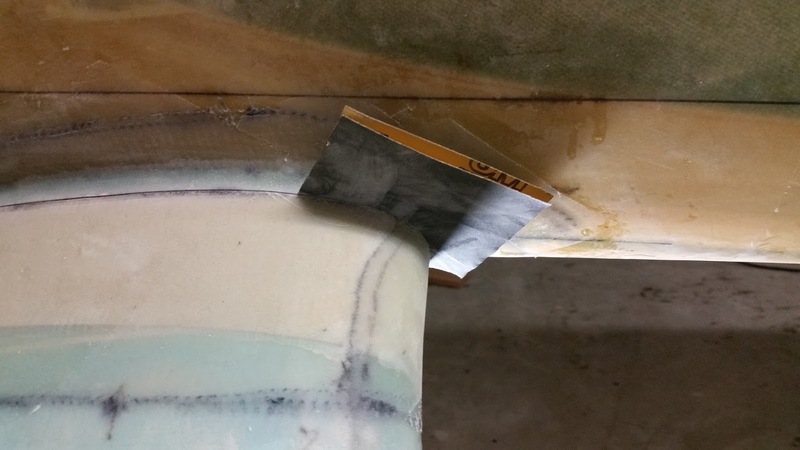 I wrapped the leading edge up past the center point and left an overhang at the back supported with card stock. Here you can see the back edge after glassing the bottom and some trimming and sanding to blend into the existing MLG fairing. Once I had it the way I liked it, I used a piece of card stock to form a template so I could get the other side to match. 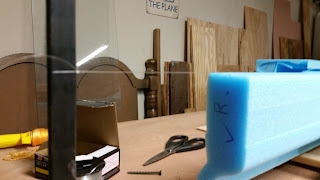 I removed foam from the aft edge and used micro to fill the wedge where the top glass would meet the back edge. It worked pretty well. 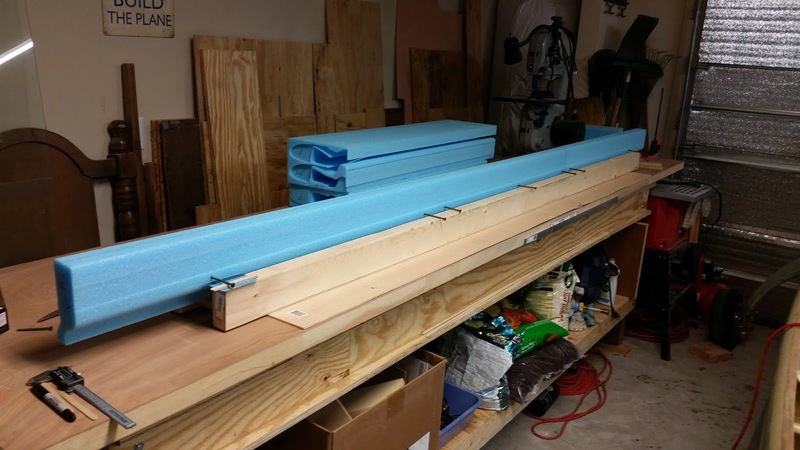 After all the glassing was done, I used an xacto saw and a Dremel with a small saw to carefully cut along line separating the PVC foam from the white Last-A-Foam. I used a sharpie to help mark it. After cutting the fairing loose from the fuselage, I used folded over sand paper to clean up the cut line for a nice look. I also removed the gear and painted the exposed foam inside the fairing with micro to protect against water intrusion. 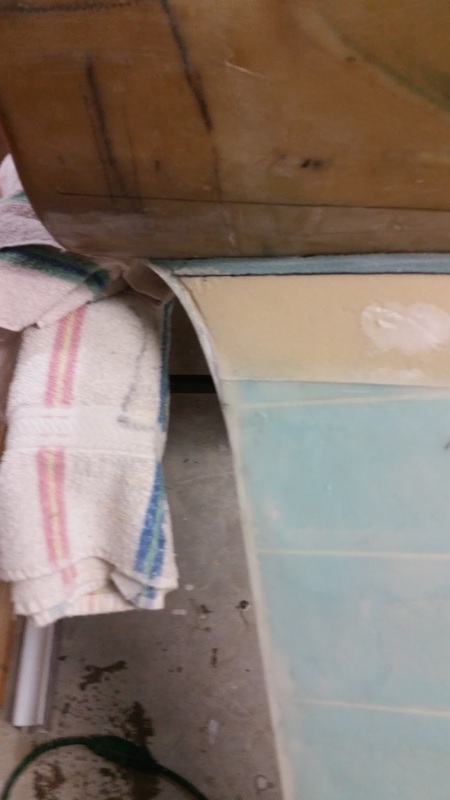 I also wanted to ensure water could not get trapped anywhere in the gap so the smooth micro finish helps ensure the water drains out the bottom cut line. I uncovered a problem after separating the MLG cover on the bottom. 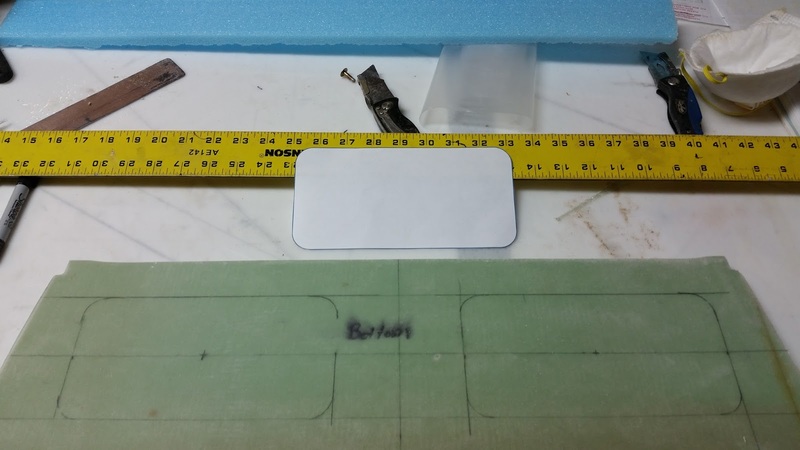 I found that I would need to make a few adjustments to accommodate where the corner screws landed for my cover. I didn't see that coming. I couldn't move the fasteners without causing a conflict with getting the gear in and out when needed. So I made adjustments to the intersection fairing on the bottom. I think it turned out fine. Main Gear Fairings & MLG Cover Complete! Although the MLG strut has an airfoil shape to it, it's formed in way that puts it out of alignment with the air stream when it's in cruise. That creates unnecessary drag which reduces speed and fuel efficiency. Several builders (Wayne Hicks, Kevin Walsh, and others) have formed fairings over the strut to realign the aerodynamic shape which reduces drag and increases speed. Kevin and Wayne did it slightly different but the result is very similar. 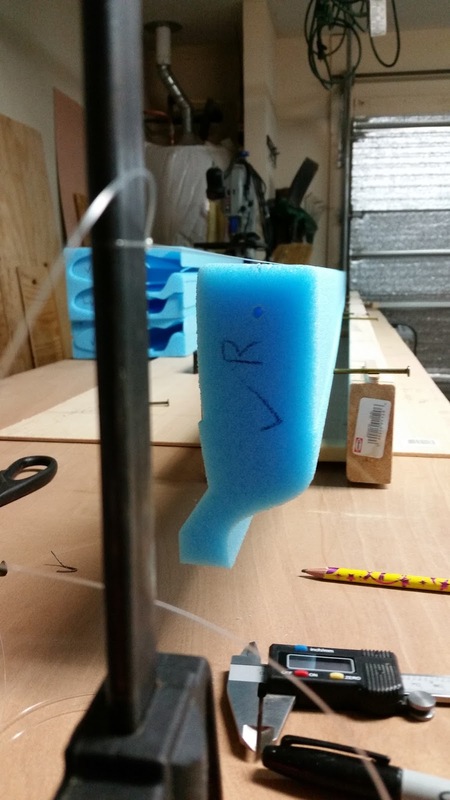 Kevin worked to have his made available through Eureka CNC. These are what I used. The fairings come in two long straight pieces that won't bend around the curvature of the strut so you have to cut it into pieces. 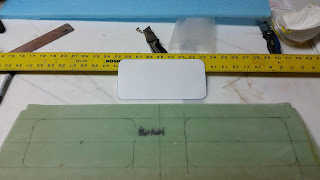 I cut it into 8 pieces, larger widths toward the top and thinner widths where the strut curves sharper. 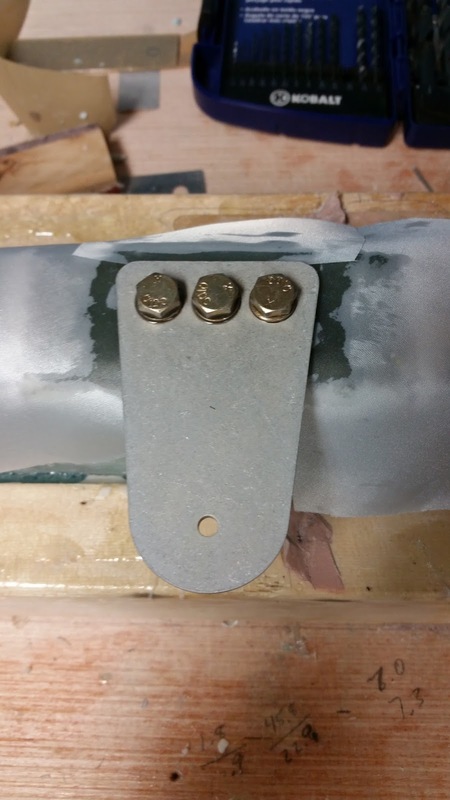 I positioned the top piece about 3/8" gap from the fuselage side and went down to about the top of the brake heat shield. I'm assuming that some of this will end up being trimmed off when the wheel pants are built and installed. Then I tested the fit by taping the pieces on each leg. I numbered each one to ensure I put them on in the proper order. 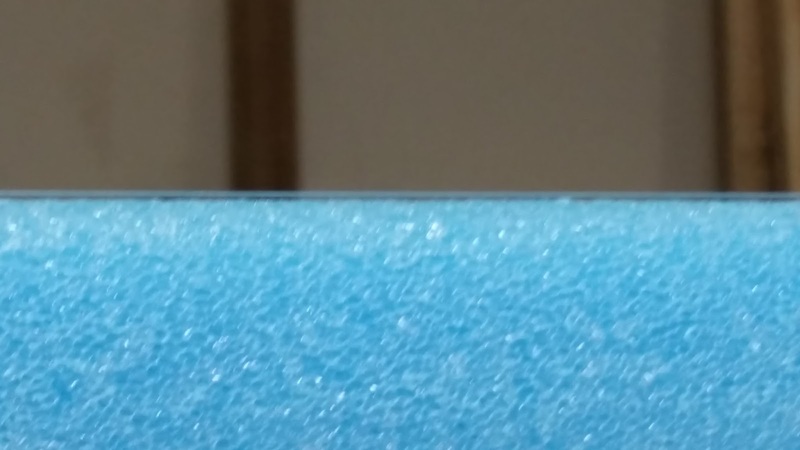 Note that the closer to the bottom you get, the foam get's very thin and hard to keep from breaking. To the left is my poor man's vacuum bagging technique with a small shop vac. 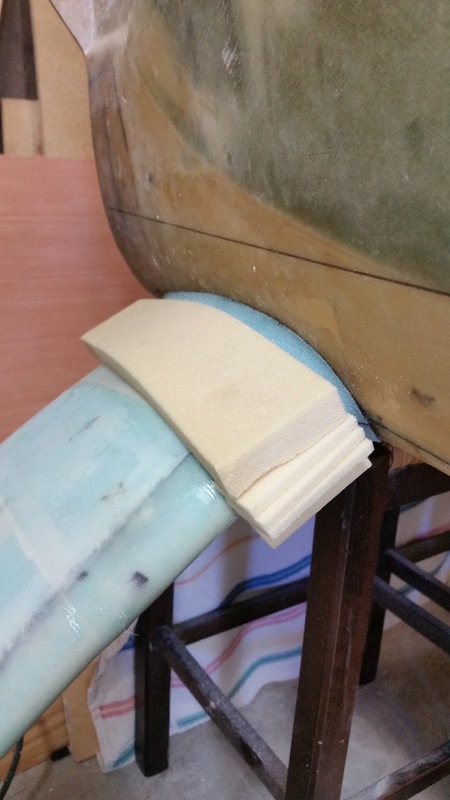 It worked well enough to keep the pieces all together and aligned while they cured. To the right...taken after the foam has been micro'd and glassed with 2xBID. Notice the white trailing edge. I glassed the bottom side first and then removed foam from about a 1/4" or so on the top at the trailing edge, filled the gap with micro, and glassed 2xBID on top. 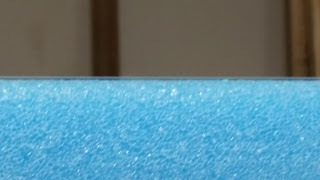 This gave it a nice solid sharp edge that should be able to survive a minor hit without permanent damage. The bottom was trimmed off to be level while sitting on the ground. 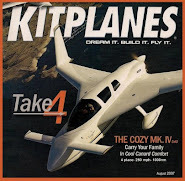 Next there needs to be a fairing built for the intersection of the MLG fairing and the fuselage side.